The most popular type of android docking stations are android speaker docks. Android speaker docks range from small docks with low sound volume and no bass, to large and powerful android speaker docking stations with many watt output power and subwoofer. What to look at when buying android speaker dock. In each of these categories you can find different quality, design, sound power, loudness android speaker docks. In this article we have listed the best speaker docks you can find at market. Next thing to look at, when buying an android speaker dock is how much you want to spend for this dock. If you want to listen to premium quality sound, you will have to pay more than for regular android docking station. Also, usually the cheapest android docks are made from cheap plastic and most of the time do not have an attractive design. Top docking station manufacturers like Philips and Samsung always think about their docking station design and almost every time you will find that their docks not only sound great, but also looks beautiful. Another thing you need to consider is the manufacturer of android docking station. As mentioned above, there are some more popular docking station manufacturers that have built a reputation among users. Some of these manufacturers are Samsung, Philips, SONR Labs, RCA and others. The last thing you should definitely look at are reviews about certain docking station. What professionals and docking station users have to say about the product you want to buy. If all of these points meet your criteria, then you probably have found good quality android docking station. To help you choose the best android speaker dock, here we have listed the top 5 android speaker docks that you can get. This docking station is one of the Philips Fidelio android docks series. It is one of the largest Philips android speaker docks with two 5W speakers. This android dock has got adjustable micro USB plug so you can charge different android phones with usb port also on side of the phone, not only on top or bottom. AS140 dock has got built in AM/FM radio, digital clock and alarm clock function. It has got both bluetooth and 3.5mm AUX jack, so you can stream music wirelessly, or connect your device with audio jack, if it does not support bluetooth technology. Philips also offers one year warranty for this android speaker dock. This Philips Fidelio AS140 android speaker dock is made for those, who do not want to pay a lot of money for one of the top android docking stations, but still want a good looking device, which has decent level of loudness and clear sound, and also is packed with many useful features like AM/FM Radio, Digital clock and Alarm clock. This android speaker dock is the best docking station for your bedroom. This is the cheapest of two top Samsung android speaker docks. Cheapest is not the right word for this dock, because it is still the second most expensive docking station in this list. And with the price comes a lot of great stuff this docking station can offer. The first great thing everyone will notice about Samsung DA-E670 docking station is its amazing design. It has got really classy design and will look good anywhere you place it. It is equipped with 40W speakers that produce clear and loud sound. One minus in design is that glared plastic surface attracts fingerprints, but dock comes with special cleaning cloth that will help you to maintain the surface of dock as clean as possible. As with all high end Samsung speaker docks, you can connect both Android and Apple devices, and even mp3 and mp4 players with AUX cable. Samsung DA-E670 speaker dock is made for those, who really enjoy classy and pleasing design, and also want to listen to clear and powerful sound produced by 10W speakers. This speaker dock is compatible almost with any Apple and Android device. 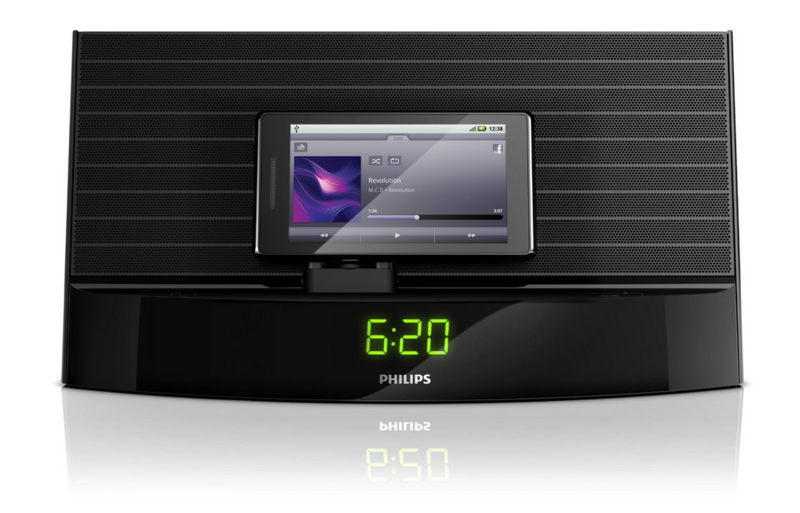 This Philips android speaker dock is another great dock from Philips Fidelio docking station family. It is smaller in size than Philips AS140 dock, but also has got 10W output power. This docking station made in our top 5 list because, unlike other docking stations, it is also portable. It can run on AA batteries and you can take it anywhere you like, even if there is no place to charge the docking station. It also has got nice design, like other Philips Fidelio docks. The sound quality is not as good, as with the expensive android docks, but certainly is one of the best for the price, and will be more than enough for everyday music listening. You can stream music to this dock with bluetooth technology or connect your device with AUX cable. Also as with other Philips docking station, AS351 has got 1 year manufacturer warranty. Philips Fidelio AS351 is made for those, who want to take docking station with them anywhere they go, because it can run on batteries, and listen to favourite music tracks on good quality speakers. This is the only docking station in our top 5 android speaker dock list that is not manufacturer by the well known manufacturers, but less known SONR Labs. Actually SONR Labs has made good job manufacturing this android docking station. It sounds good, looks good and price for this dock is also acceptable. One thing that this dock has not have is Bluetooth technology, and it is not included on purpose. Manufacturer says that this docking station supports more oldschool AUX cable connection, that is lot more reliable and has got better sound quality than bluetooth. However, other top android speaker docks also support AUX connection and bluetooth technology together. So if you want to be able to listen music from dock speakers wirelessly, this dock is not made for you. Other than that, it is really good device. It has got great sound quality and volume and we also liked the design, it looks as good as Philips or Samsung made docks. As it does not have bluetooth connection, the setup for this dock is a lot easier than others. SONR Labs android dock is made for those, who do not want to bother with bluetooth and like reliable AUX cable connection better, want to enjoy good sound quality and want to have docking station that will look good any place you use it. This is truly the top android speaker dock manufactured by Samsung. This dock, without any doubt, is the best android speaker dock you can get for your android device. And actually not only android device, because you can connect Apple iPhone, iPad or iPod, any Android smartphone or tablet with Bluetooth 3.0 connection, mp3 and mp4 players with AUX cable, and even stream music from your desktop computer or any other device with wifi connection. This is the only speaker dock that supports wifi connection. The sound quality of this speaker dock is absolutely superb and top quality. You will not notice any difference from top level home sound systems. It can also produce good level of bass from built-in woofer. Samsung DA-E750 also has got beautiful and classy design, as other Samsung DA-E570 speaker dock. If price of this dock is not a problem for you than Samsung DA-E750 android speaker dock is the best choice for Android speaker dock that you can get. This docking station is made for both Apple and Android device users, and for anyone, who wants to listen to top level sound quality and wants to enjoy all the good qualities and features this docking station can offer for you. Thanks for putting together something for android users. I am surprised that there has not been more of a demand our response to the need for more android based docking stations. IPhone/Apple docking stations are everywhere but not so for android. Thanks for providing some products and even evaluating them! Yes, the demand for Android docks is huge but there are not that much quality products around. I think this is because it is hard to create an universal device that would work with all the different form-factors and micro USB port placements. Let’s hope that this will change in the future! I am surprised Phillips are in top 10 as now had 3 and all fail to charge the phone essential for smart phone. they work for a while then give up seems the chargers cant cope with load of average phone !!!!! I have an HTC one M8. I am looking for a dock that can be portable for travel as well? I mostly use my phone for NFL mobile and Netflix, is there a combination of portable dock which may also place my phone horizontally? Thanks, Dan!